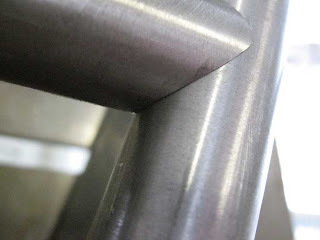 The first three pictures show top tube miters. I miter my tubes with a 1952 Bridgeport vertical mill. I love that old machine. Mounted in the Bridgeport is a mitering jig/fixture that holds the tubes and insures the miters are in the proper phase. 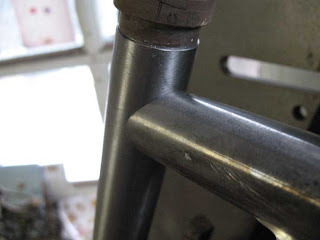 This is important especially with the top tube. 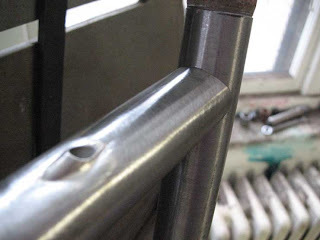 The top tube is mitered on both ends and if the miters are out of phase the seat and head tube centerlines won’t be in the same plane. That’s less than ideal. So I make the miters as perfect as possible and the bikes are better for it. The last two pictures are of a frame in the Marchetti jig. 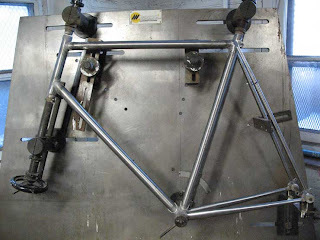 The front triangle is already brazed and I’m getting ready to braze the rear triangle on. The close up of the seat lug shows a little excess silver around the seat lug edges. That’s called flashing and will be removed after all of the brazing is done. That cleanup is part of the filing and thinning of the lugs. 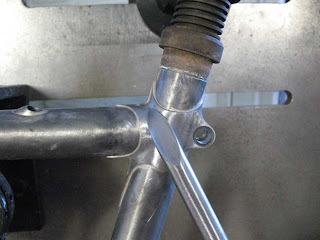 If the lug was brazed cleanly like this one, the flashing could be left because it won’t show under paint. But I like to remove it so if the frame is ever repainted by someone else he or she will be impressed with the clean work. That makes no business sense but it’s just a source of pride for me.